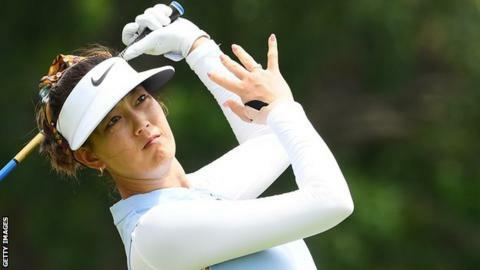 Defending champion Michelle Wie says she is "absolutely gut-wrenched" after making the "heartbreaking" decision to pull out of the Women's World Championship in Singapore. She failed to complete the first round because of a recurring wrist problem. Wie, who had surgery on the injury in October, said an MRI scan on Thursday showed "nerve entrapment". "I made the decision on 15 to withdraw because at that point, I was unable to lift the club," said the 29-year-old. "After getting surgery, I had it in my mind that I was going to be completely pain free when I came back to Asia to defend my title. "I was so ready to be pain free, I ignored a couple of warning signs. As a result of not listening to my body, I endured a bad flare-up during my round. "Being in that amount of pain, I was scared that I could possibly do further damage. "Deciding to withdraw during the tournament is always the hardest decision to make but it was heartbreaking." England's Jodi Ewart Shadoff is in a five-way tie for second place, two shots off leader Amy Olson after two rounds. American Olson, who carded a three-under-par 69, is seven under for the tournament. Ewart Shadoff went round in 70 to move to five under, alongside Thailand's Ariya Jutanugarn, Spain's Azahara Munoz, South Korea's Inbee Park and Australia's Minjee Lee. England's Georgia Hall is level par after a second-round 71, while compatriots Charley Hull and Bronte Law are one over and three over respetively. Scotland's Catriona Matthew is eight over.